We act as credit brokers and we are not a lender. We will introduce you to a limited number of lenders who may be able to help finance your purchase. These lenders may or may not pay us for the introduction. †Includes £3500 Deposit Allowance Paid By Manufacturer. *Excess mileage charge of 7.2p per mile. If you exceed this annual mileage then excess mileage charges will be applied by the finance provider at the end of the agreement should you choose to return the vehicle. Finance subject to status. A guarantee may be required. Terms and conditions apply. Unless otherwise stated, metallic paint at extra cost. Library image for illustration purposes only. 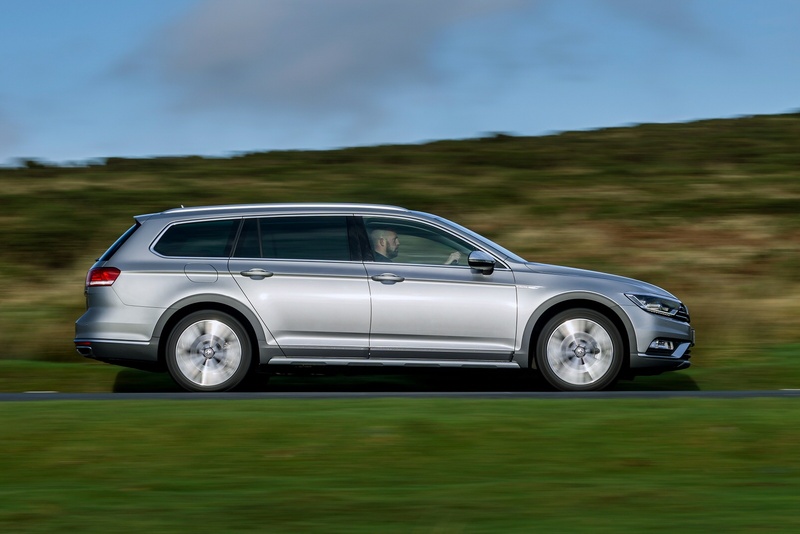 Volkswagen's second generation Passat Alltrack is a family-sized 4x4 estate that continues to strike an appealing balance for many buyers who don't need - and probably don't want - a traditional compact Honda CR-V or Toyota RAV4-style SUV. It has the quality look and feel of something premium and much more expensive, blended with an extra dose of subtlety that'll suit potential buyers. Plus it'll be as good off road as you'll need it to be. In other words, it ticks a lot of boxes. If I wanted to know what a Passat Alltrack owner looked like, I only need to look in a mirror. Mountain bike, skis and karting equipment that needs moving about, mid-forties, has a decent job, maybe fights a little shy of the bling-ier brands. Someone who probably wouldn't previously have been attracted to a Passat Estate. But then, this one isn't quite as we know it. The ride height is a touch higher and the bodywork a touch showier to tweak the lifestyle appeal a small but crucial click towards more outdoorsy hunting, shooting, fishing - heck maybe even jetskiing - folk. People who would usually need to buy a fully fledged SUV, all the while gritting their teeth against a perceived social backlash from eco-friendly neighbours. By equipping this car with 4MOTION all-wheel drive and giving it with a modicum of light off prowess, Volkswagen claims to have ensured that they don't have to. So, it's a plush, family-sized SUV-flavoured 4WD estate. Something we've seen before of course - but not quite like this. Wolfsburg claims to have brought us a car of this kind that bridges the gap between affordable but less premium models of this kind from Skoda and Subaru and the more desirable but much pricier ones from Audi and Volvo. A place you'd think that a significant number of buyers would like to be. Let's try it. 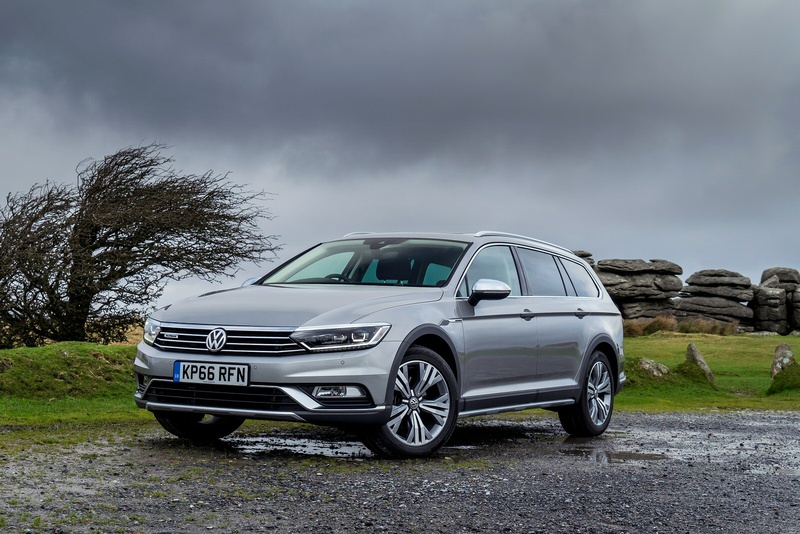 The Alltrack isn't much different to drive than the standard models as only a few changes have been made over the regular Passat. The heightened suspension does have a small effect on handling though, as the centre of gravity is now a little higher. It's a small price to pay though as it stops the underside of the car from being damaged when off road and allows it to go over ground that the regular car couldn't look at. Performance is a fraction down on the regular car but not enough to be noticeable and the Alltrack has more than enough power for most, especially in the models with the more powerful engine. Two engines are currently available for the UK market, both 2.0TDI diesels. One is the 150PS version which comes with a manual gearbox. The other has 190PS and comes only with the DSG automatic. The extra power of the pokier model is desirable as is has extra torque more widely spread over the rev-range. Not only is this useful for off-road but it allows the car to give its performance in a more relaxed manner. The performance is very accessible off road too. This car's Haldex all-wheel drive system uses sensors to detect any loss of grip and transfers power to the wheels with most traction. As well as making off road driving easier, this set-up ensures the driver has optimum traction during more spirited driving or in adverse weather conditions. 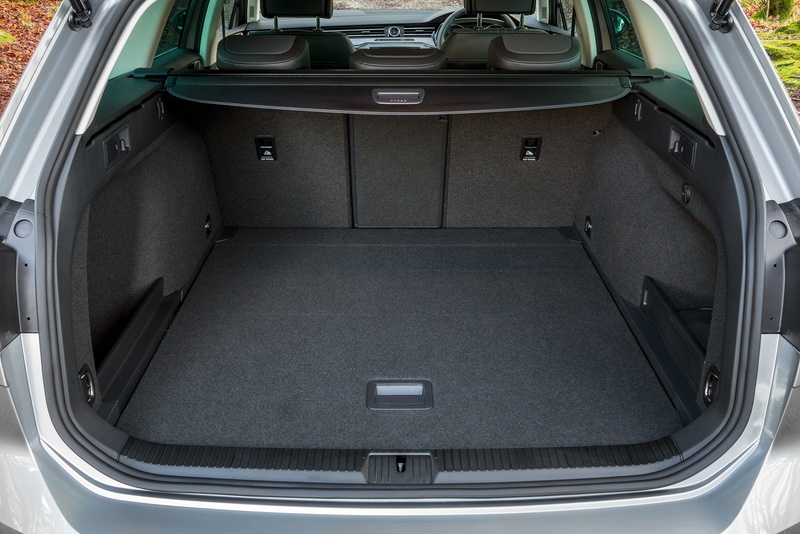 As is expected of any contemporary Volkswagen, the build quality of the Passat is excellent; materials are both hardwearing and aesthetically pleasing and the general feel of the whole car is solid but luxurious. As this is the Alltrack model. The bodywork, suspension and numerous other areas have been tweaked to cope with rough terrain. 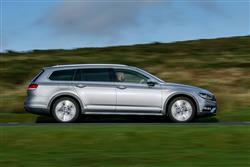 The exterior of the Alltrack looks more workmanlike than the standard Passat thanks to its plastic wheelarches, raised suspension and modified bumpers. However, the sleek lines and distinctive styling features such as LED lights remain. The Alltrack is certainly one of the more subtly designed vehicles of its kind and is all the better for it. 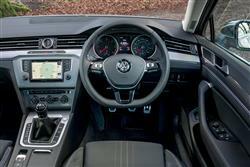 The interior of this MK8 model Passat follows the design principals of the exterior - simple but elegant. 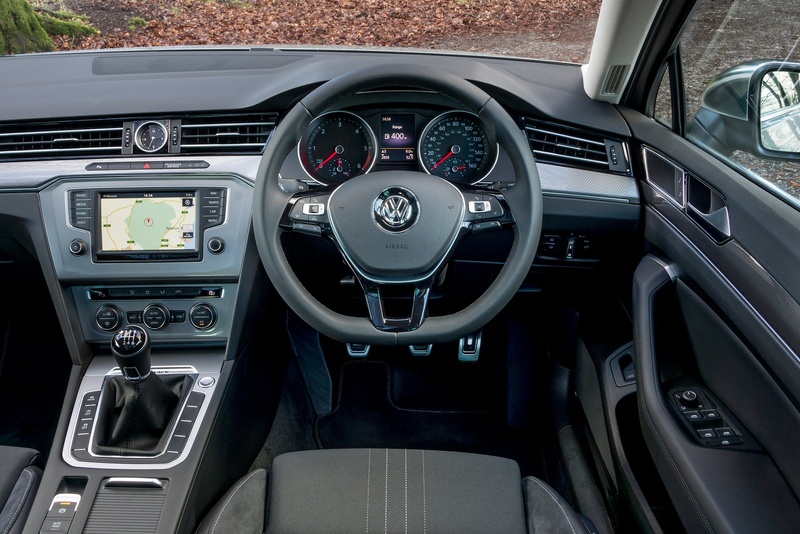 All controls are ideally located and in true Volkswagen style, feel of high quality in terms of materials and ease of use. The combination of stitched leather and metal accents give a premium feel to the cabin and by simplifying the controls, the designers have avoided an excess of buttons and switches - an affliction which many cars suffer from. 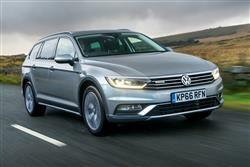 Passat Alltrack pricing starts at around £31,000 - around £2,700 more than the smaller Golf Alltrack estate. 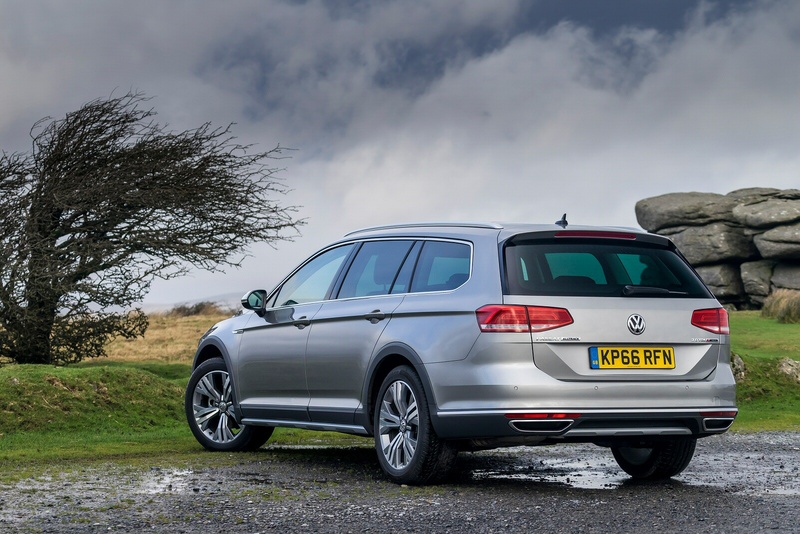 In Passat terms, the money being asked here is over £5,000 more than a Passat estate in base 'S' trim with the same engine and nearly £2,000 more than one in sportier 'R-line' trim. There's quite a premium for its off-road ability then, but standard 4MOTION all-wheel drive, 3-zone electronic climate control, unique upholstery and many other features account for the extra cost. Smart 18" 'Kalamata' alloy wheels, heat-insulating rear tinted glass, heated windscreen washer jets and electrically foldable door mirrors are all standard equipment, as are brushed stainless steel pedals and silver anodised roof rails. 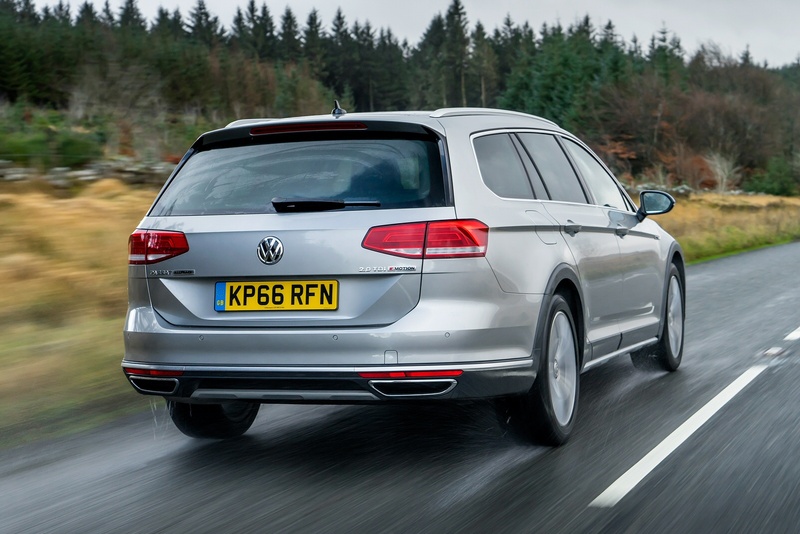 Various Alltrack logos throughout the car and various styling cues (including a chrome radiator grille and trapezoidal exhaust tailpipes) also differentiate this model from others in the Passat range. The 150PS variant comes only with the 6-speed manual gearbox whereas the 190PS model gets the brilliant 6-speed DSG dual-clutch 'box. This does come at a price though; the pokier variant costs over £3,000 more than the 150PS version. The allure of extra power and one of the best gearboxes on the market will be too much to resist for some though. 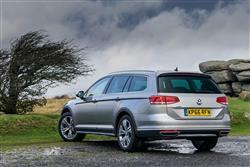 The Alltrack's list price is several thousand more than rivals like the Ford Mondeo Estate AWD and the Subaru Levorg, though it at least has a bigger, more powerful engine than the Levorg. The Mondeo is around £5,000 cheaper like for like but the Passat's interior and general quality are much better. The Passat Estate this Alltrack variant is based upon is a car that sells on pragmatism, so it's a critical component of its success that the running costs of the vehicle flag up all the right numbers. Remember that despite its SUV-style appeal, the bulk of this car's sales will still come from fleet buyers who don't give a brass tuppence about 4x4 capability. For them it's about bills, bills, bills; residual values, fuel economy, carbon dioxide emissions, insurance costs, servicing overhead and so on. The Passat Alltrack looks like it's getting off on the right foot here though. If you choose the 150PS diesel manual version, you'll get 57.6mpg on the combined cycle and 130g/km of CO2. Go for the 190PS DSG auto variant and those figures fall to 54.3mpg and 137g/km. Upfront pricing is slightly higher than some rivals, but pull residual values into the equation and the Passat looks a strong proposition. If you�re looking for a new Volkswagen Passat 1.4 TSI S 5dr Petrol Estate for sale, you�ve come to the right place. At Bristol Street Motors we don�t just have the best Volkswagen Passat 1.4 TSI S 5dr Petrol Estate deals, we also offer friendly advice and help with all your enquiries to ensure your buying experience is a happy experience.